Green Things Nursery was established in Orofino ID in the summer of 1977. Why Orofino? It has one of the longest growing seasons in Idaho. Our garden center is located in North Central Idaho on the banks of the beautiful Clearwater River and our Hardy Growth Center, located at 3000 feet are pleased to bring you the best grown plant material nature has to offer. We specialize in cold hardy and disease resistant plants. We have always felt it important to share with others our love of horticulture and wide experiences and are pleased to be asked for input statewide. Whether it has been seventeen years serving on the University of Idaho Agricultural Consulting Council or twenty five years helping teach seminars for the U of I Extension System, we believe in volunteering. We were founding members in the rebirth of the Idaho Nursery and Landscape Assoc. in 1978 and still serve on the research committee. Professionalism has always been important to us and we are proud to have been in the first class of Idaho Certified Nursery Professionals and both of us have served as state presidents of the INLA. Our combined 35 years of horticultural experience is enhanced with Mike’s additional M.S.in Forestry to give us a unique approach to growing trees. Our knowledge is part of the purchase [i.e. instruction booklets] included with your plant material, to help guarantee your continued success with our quality plants. 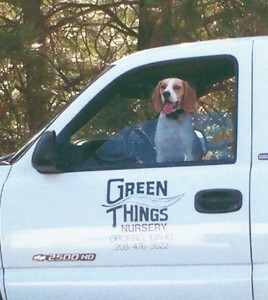 It is our pleasure to serve your plant needs and look forward to a long term relationship. PRICES ARE SUBJECT TO CHANGE AS NEW PLANTS ARRIVE AND AS PLANTS ARE GROWN INTO NEW SIZES. Ordering is simple. Use the online catalog for reference. Call (208) 476-3022. We will help you place an order. Season: March thru May & October thru December FOB. Orofino, Idaho Estimates for freight and packaging can be attained by phone or email.